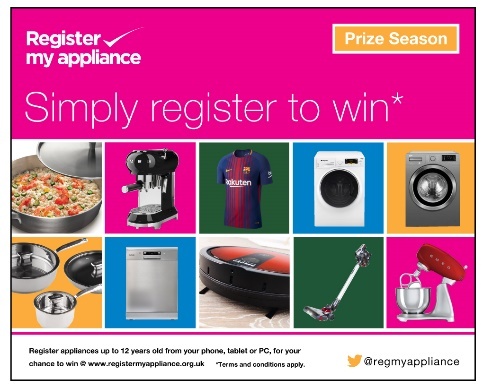 Register my appliance Prize Season offers the chance to win a fabulous range of prizes to those who register their appliances before the end of January 2018. Throughout Prize Season, many leading manufacturers are rewarding customers who register their appliances, by entering them into free prize draws. There’s a terrific range of prizes on offer – from large appliances like washing machines or wine coolers, to state-of-the-art vacuum cleaners, expresso machines, cook-ware, or for those football fans – the new FC Barcelona Home shirt. This prize bonanza, from participating brands, will run through January to include Register My Appliance Day on the 16th January 2018, which will be celebrated with further opportunities to win luxury gifts and ensure home safety. And the best is there’s no purchase necessary. To increase your chance to win*, look around your kitchen and also register your older (up to 12 years old) appliances today.